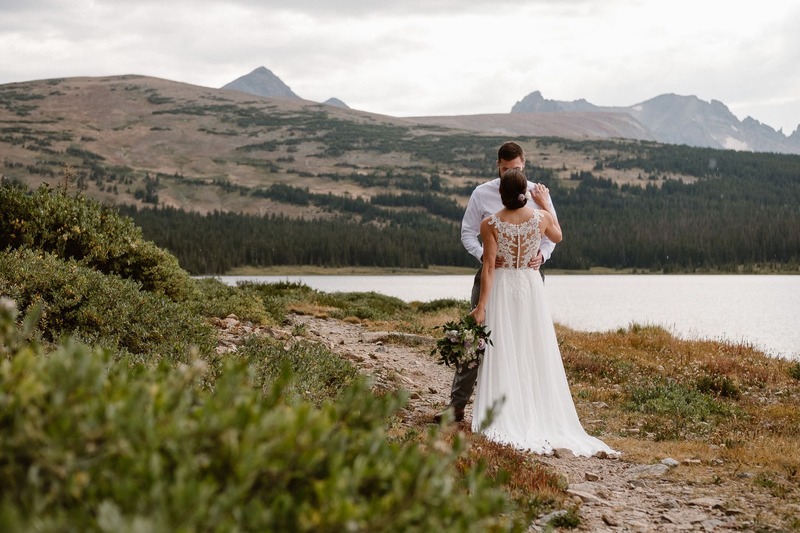 Kimberly and Kevin asked me to photograph their Colorado mountain elopement while we were hiking around in a blizzard for their adventure engagement session last winter. 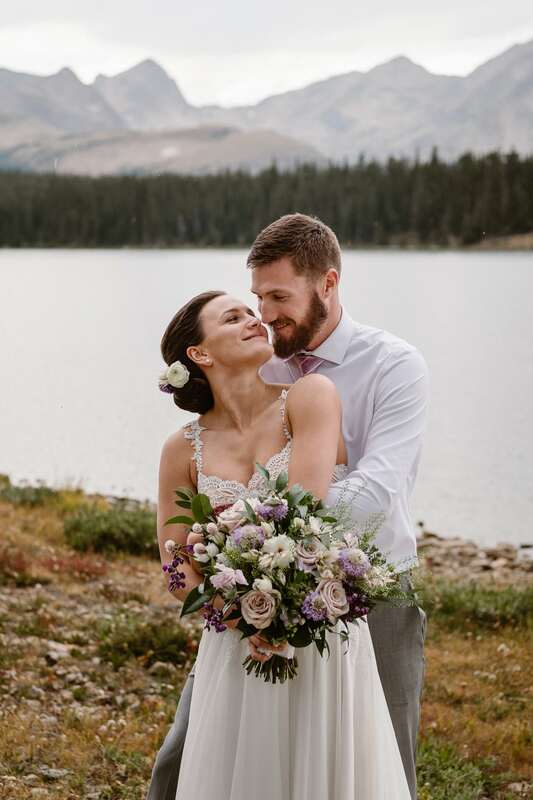 They were originally planning on eloping on 8/18/18, but when they found out that I would be in Norway that week for another elopement, they moved their wedding date to 8/25/18 so that I could be their photographer! 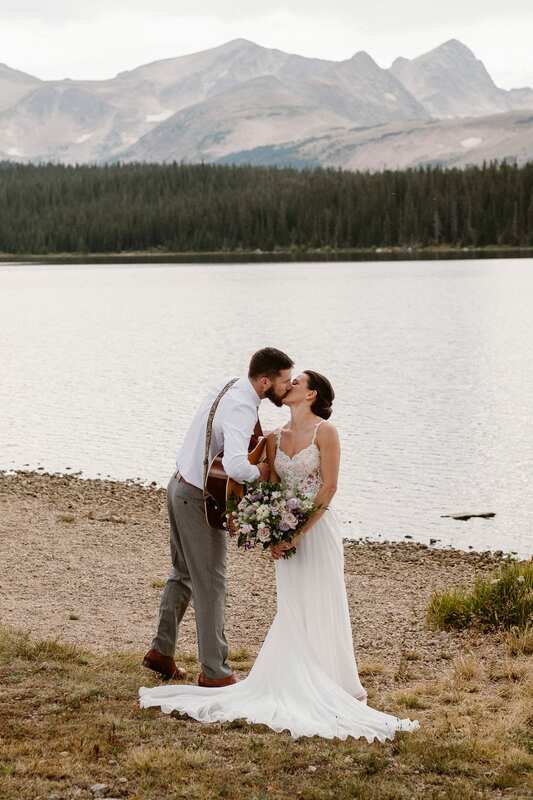 I have to say this is the biggest compliment I can possibly get as a photographer, and I’m so stoked that I was able to work with them again. 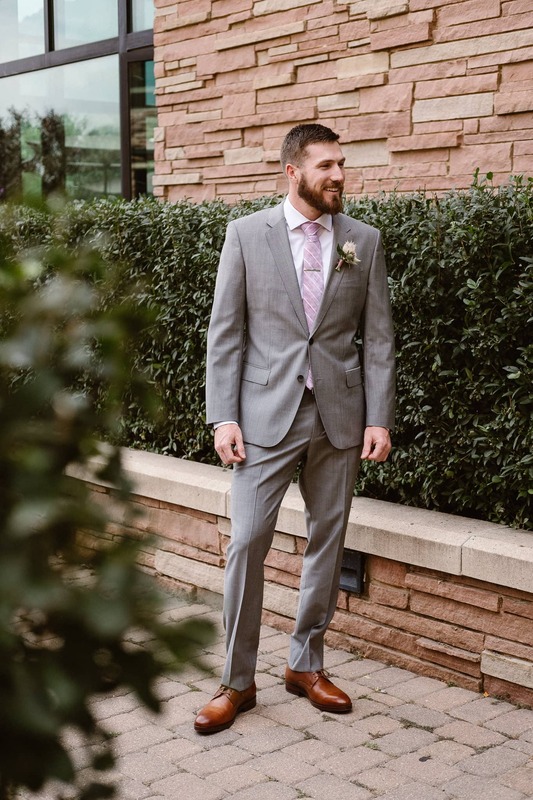 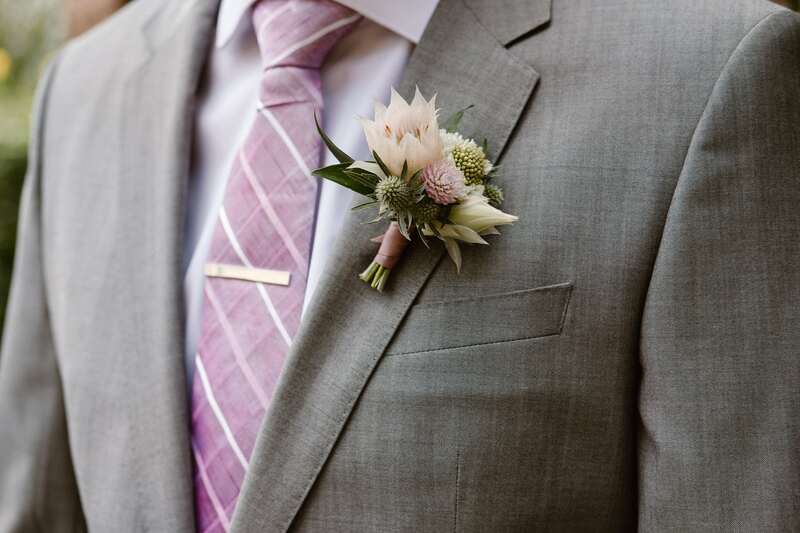 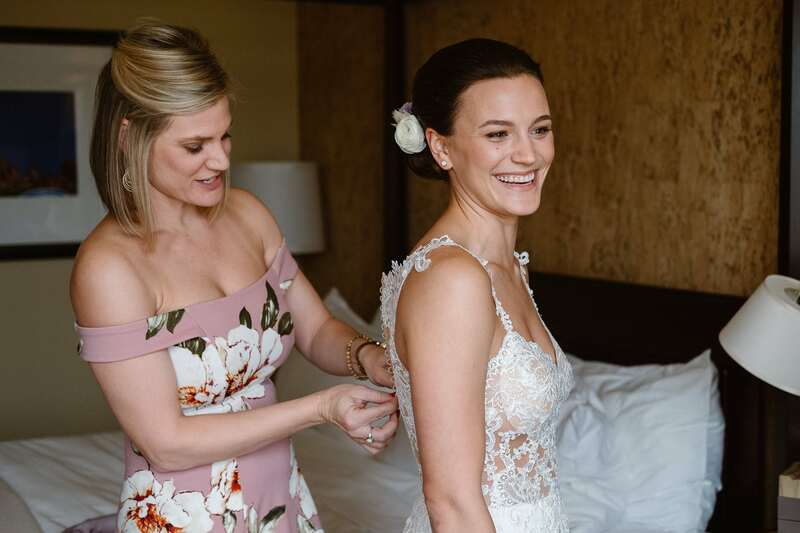 The day of Kimberly and Kevin’s Colorado mountain elopement started at the St. Julien Hotel & Spa in Boulder, where the bride was getting ready. 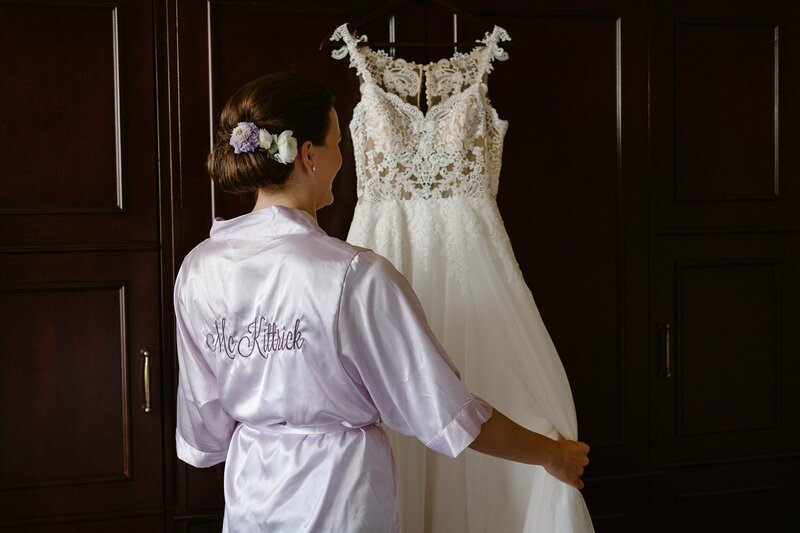 The St. Julien is one of my favorite “getting ready” wedding venues in Boulder, because the rooms all have gorgeous natural lighting. 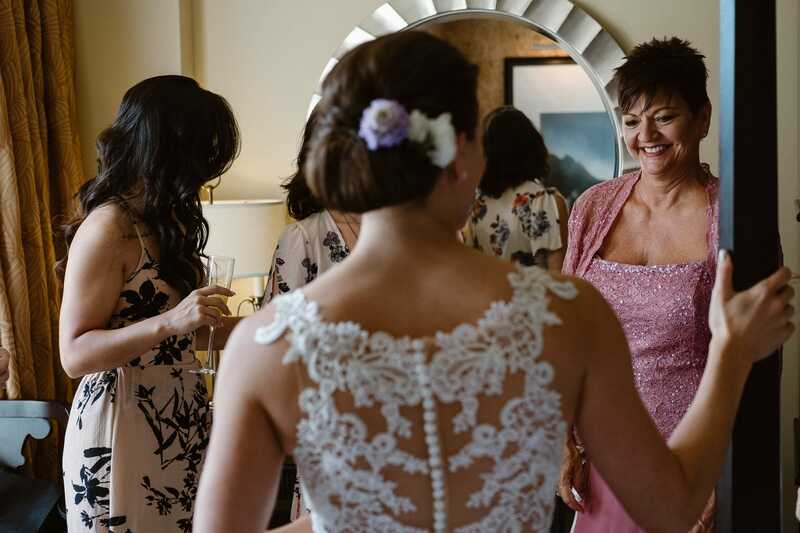 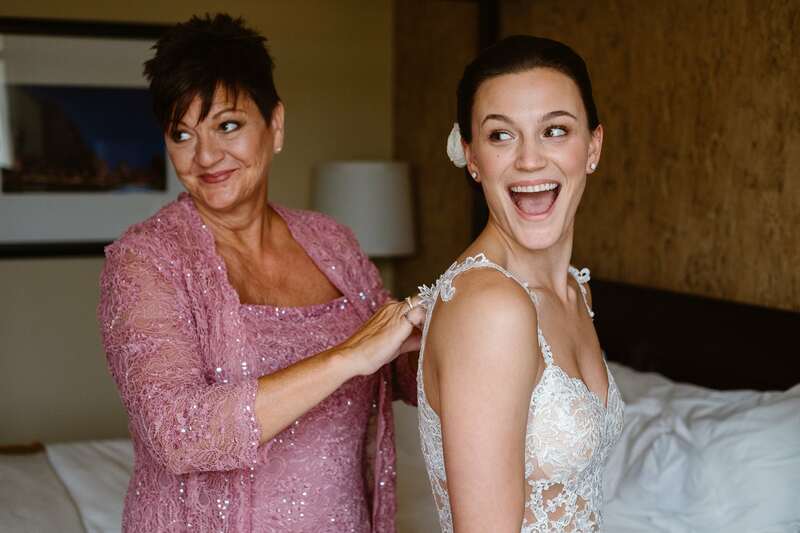 Kimberly didn’t have a traditional wedding party, but she had her mom, her sister, and her closest girlfriends with her, and I love all the excited moments they shared as she was getting ready. 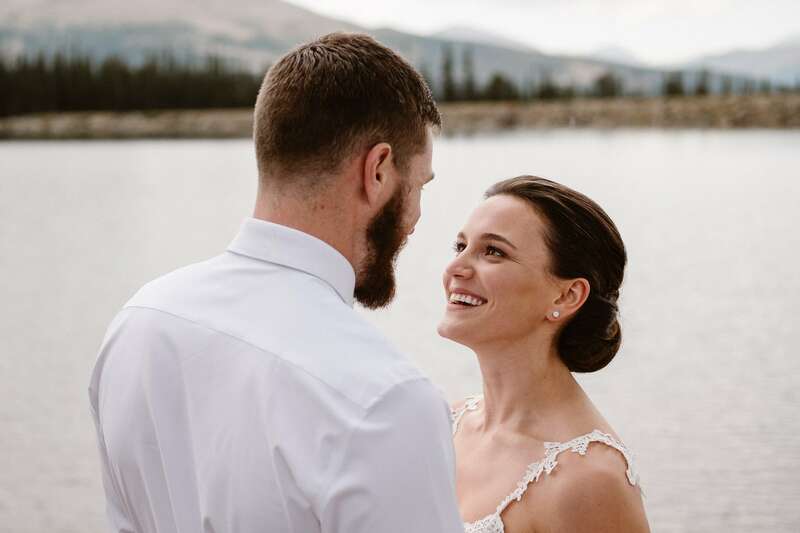 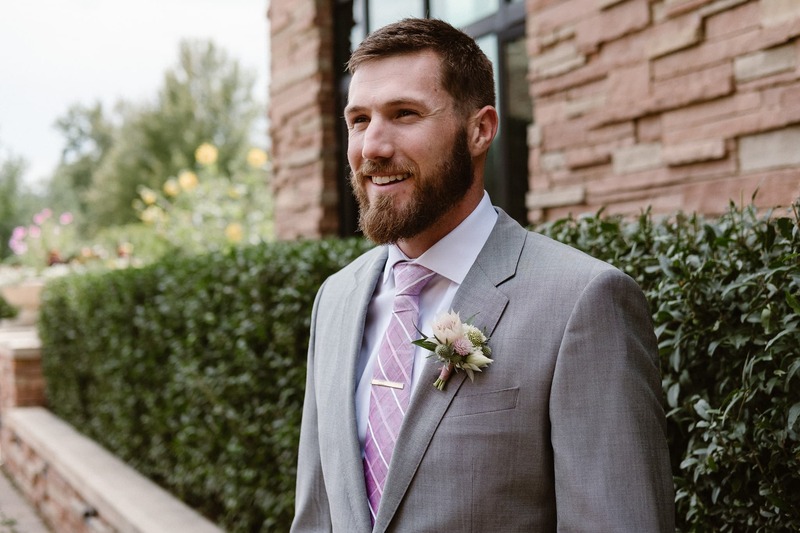 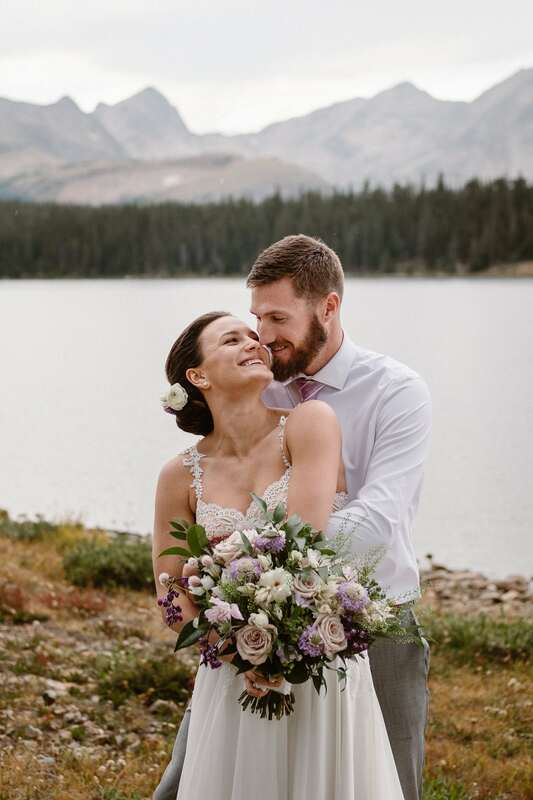 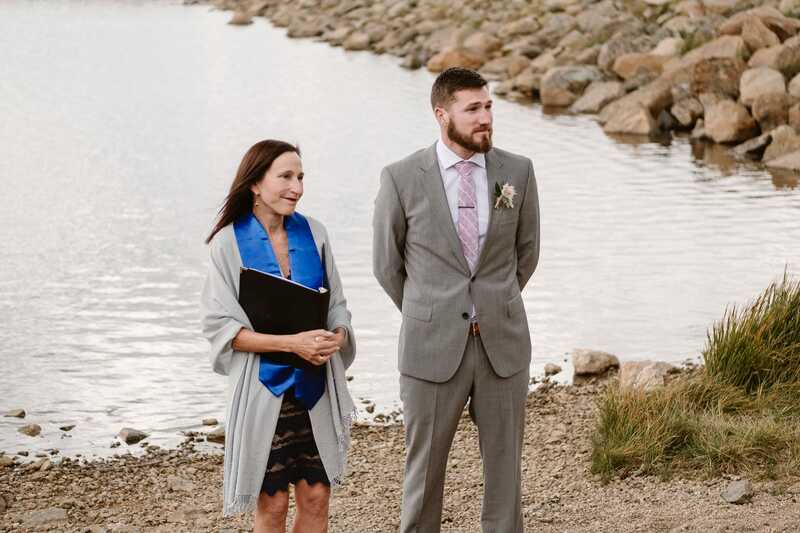 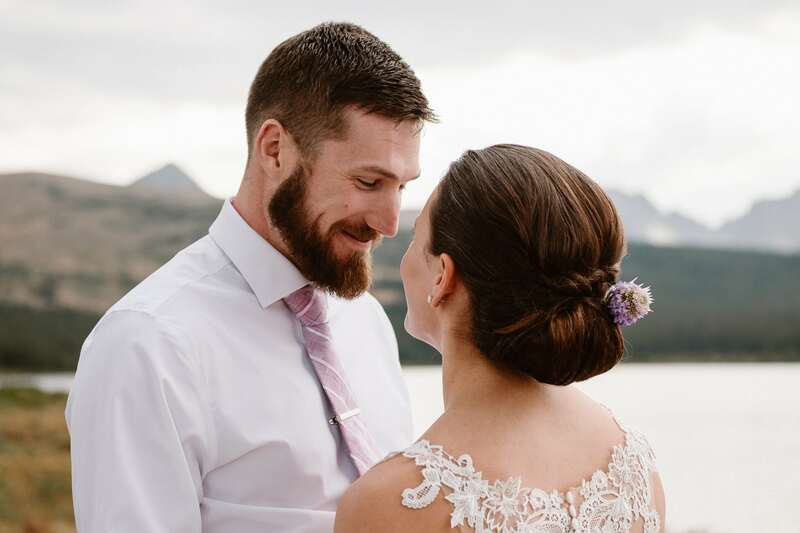 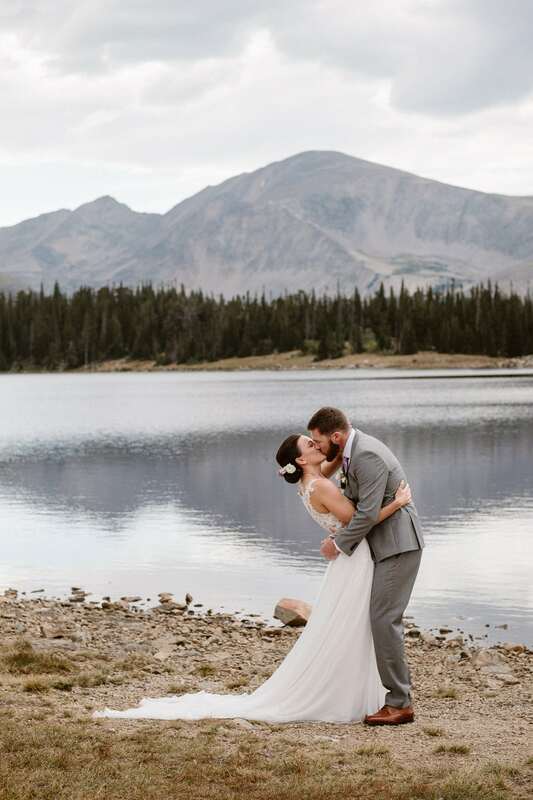 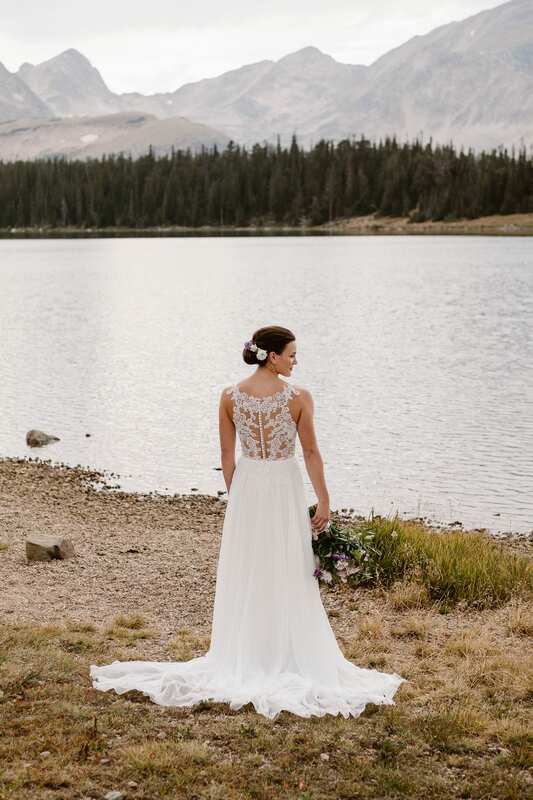 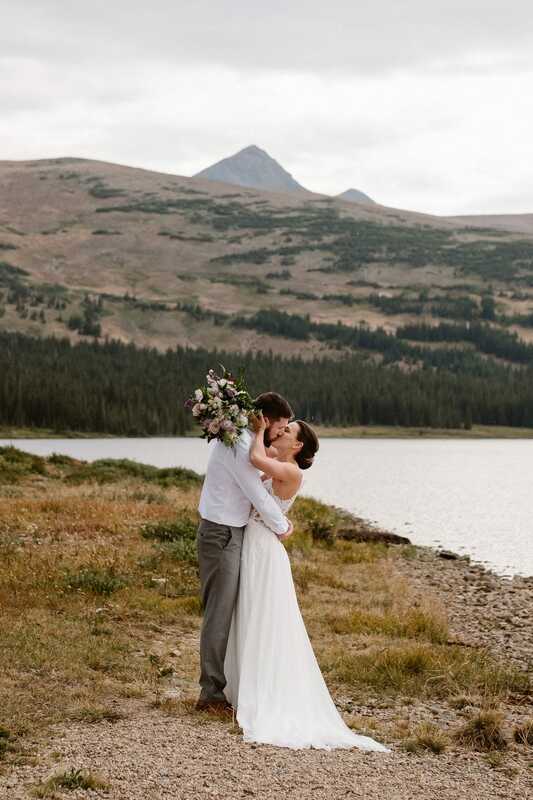 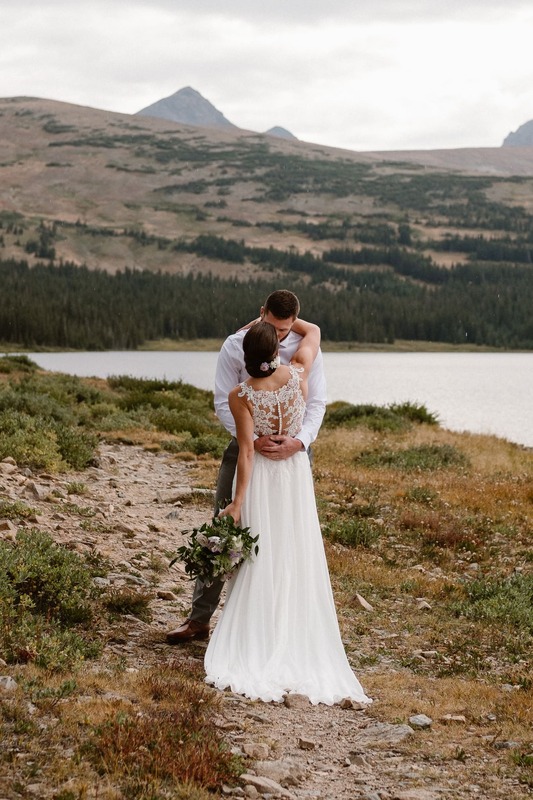 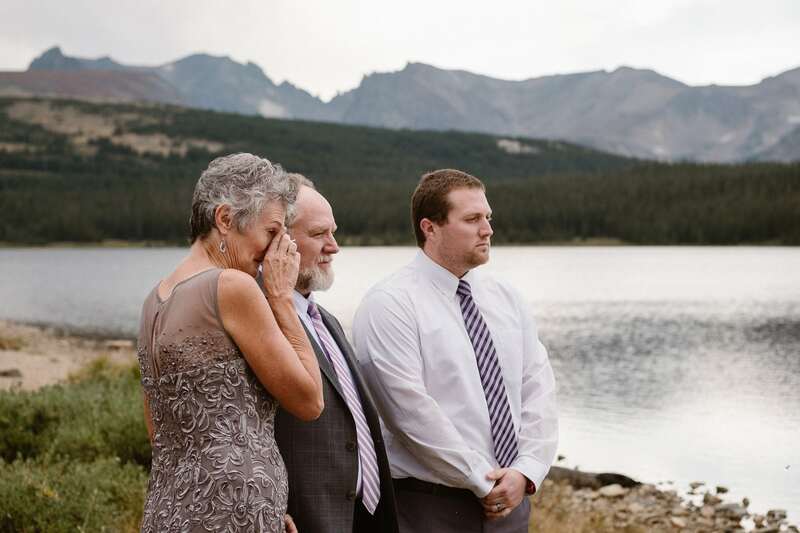 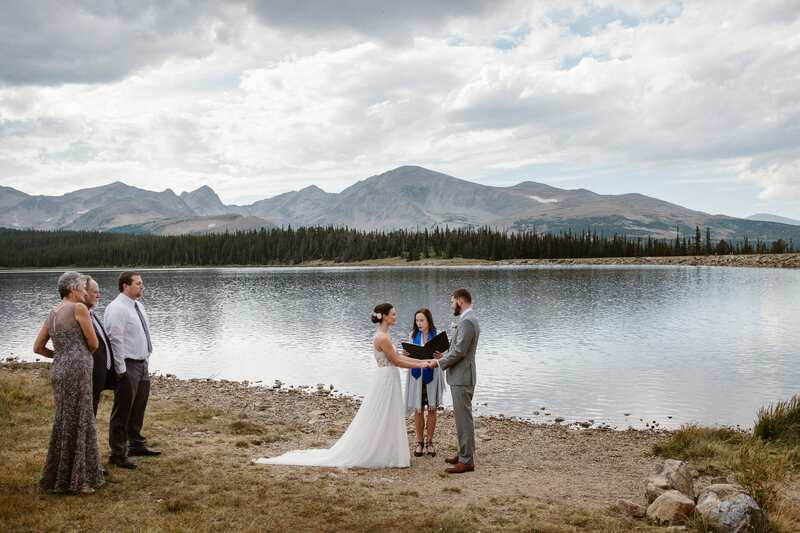 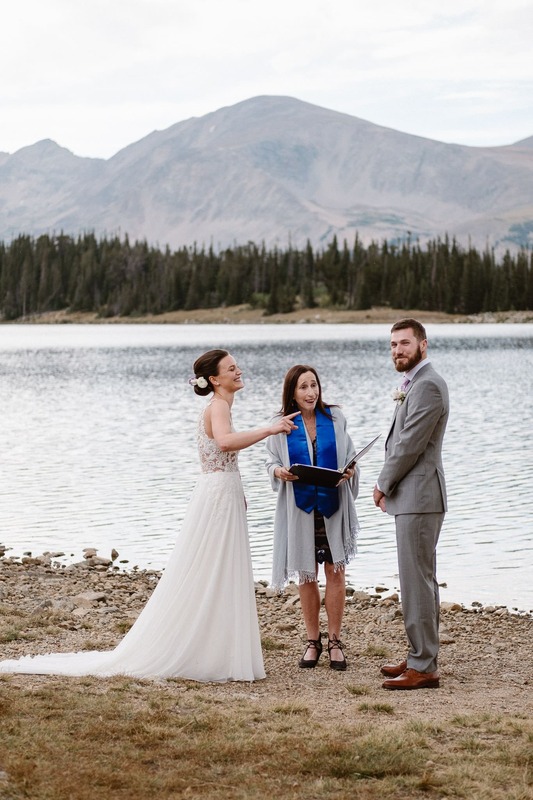 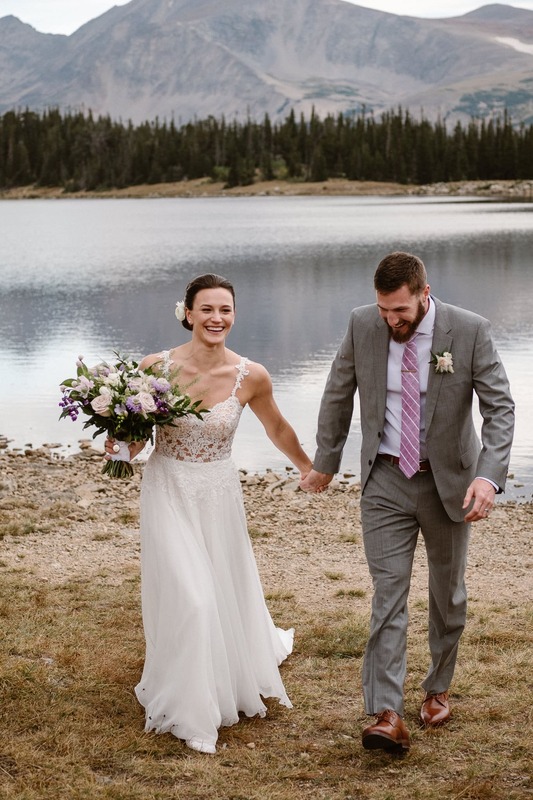 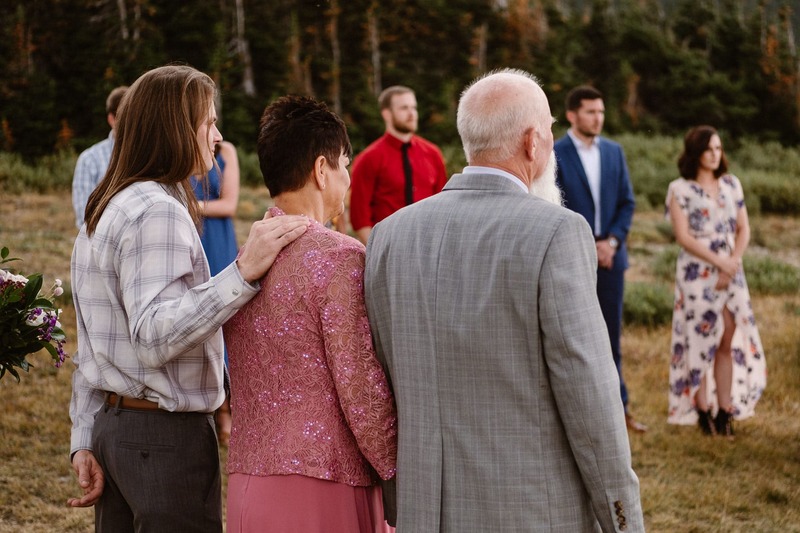 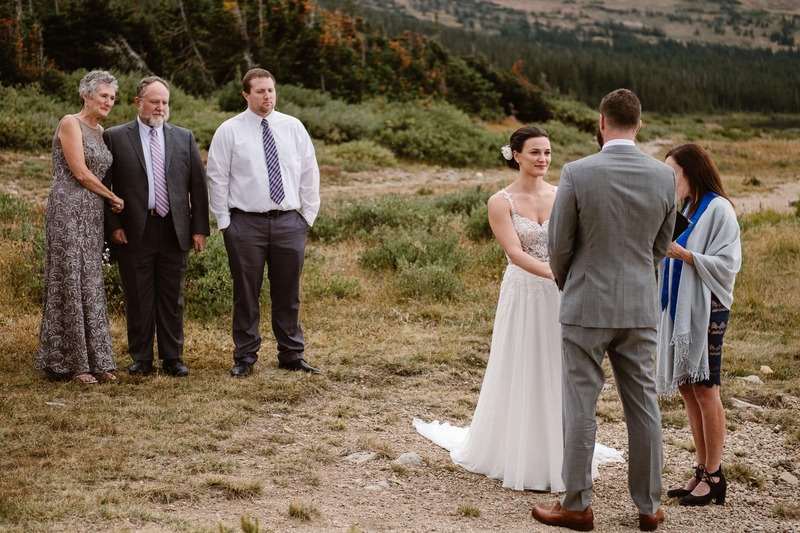 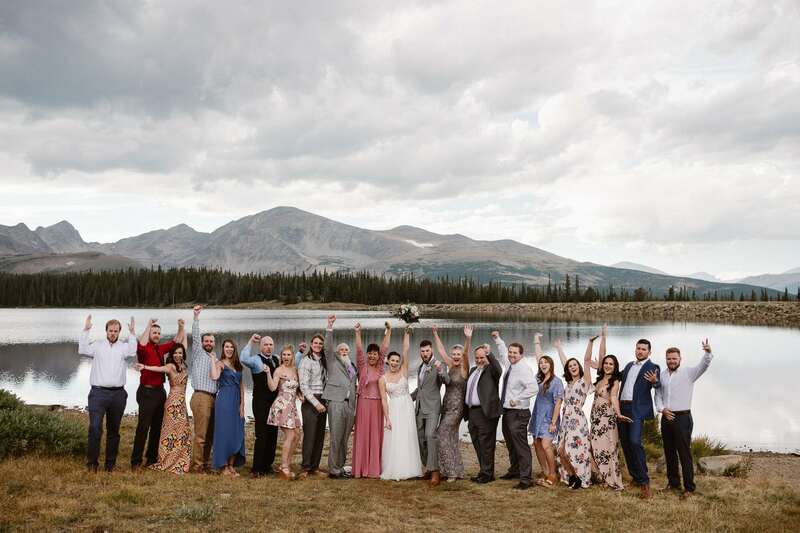 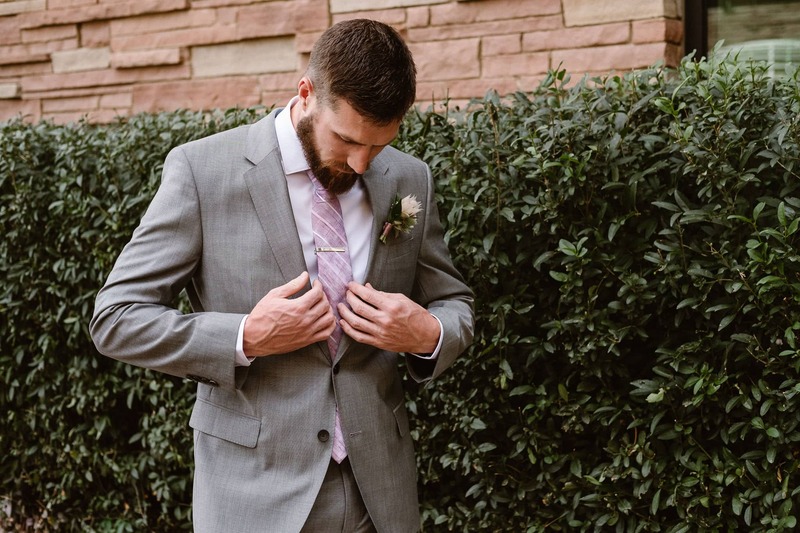 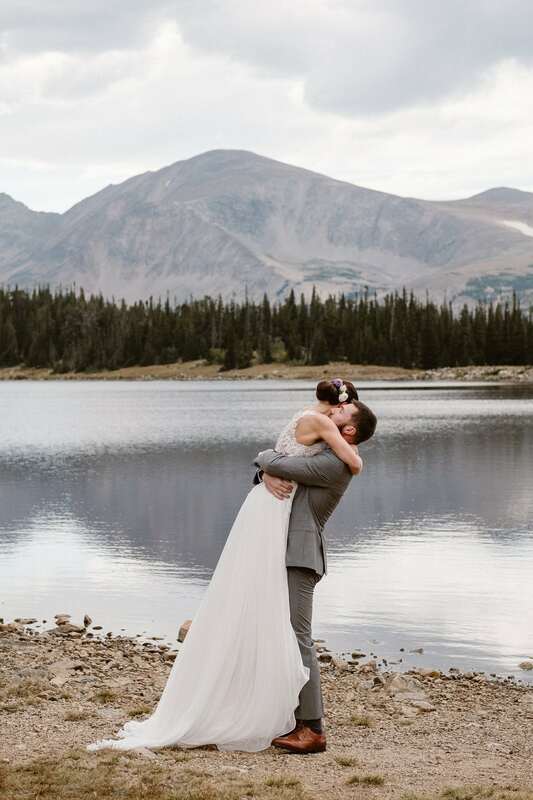 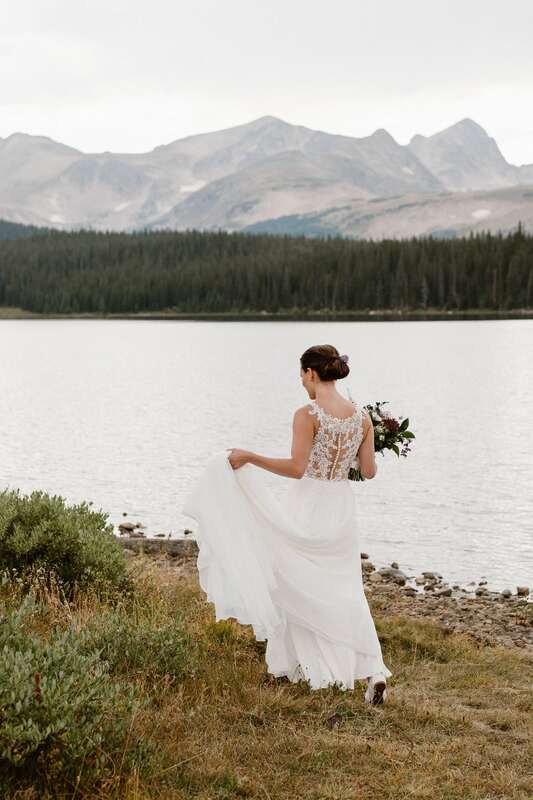 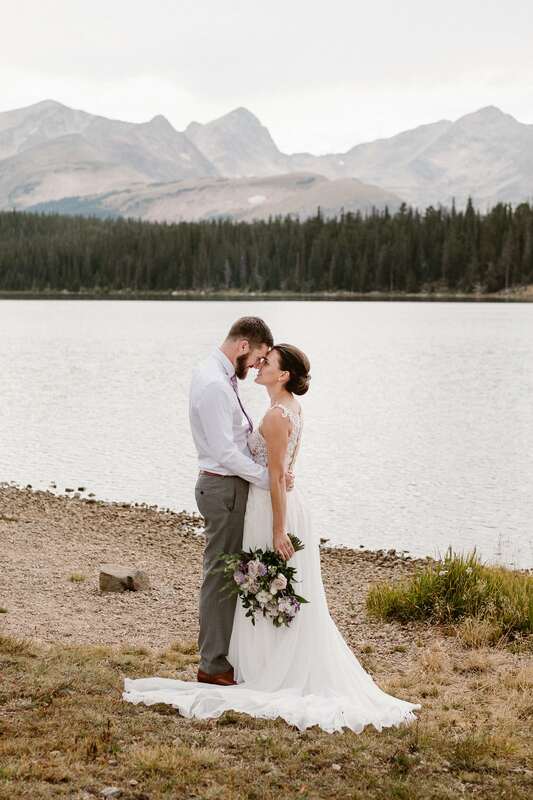 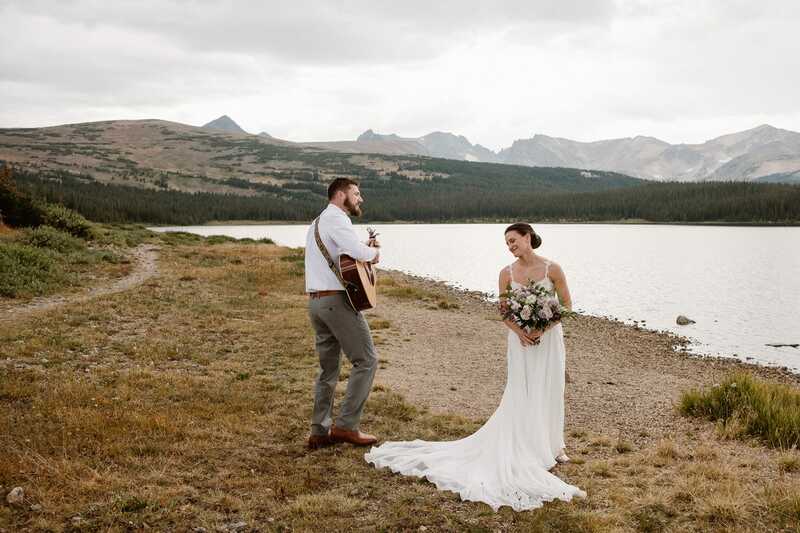 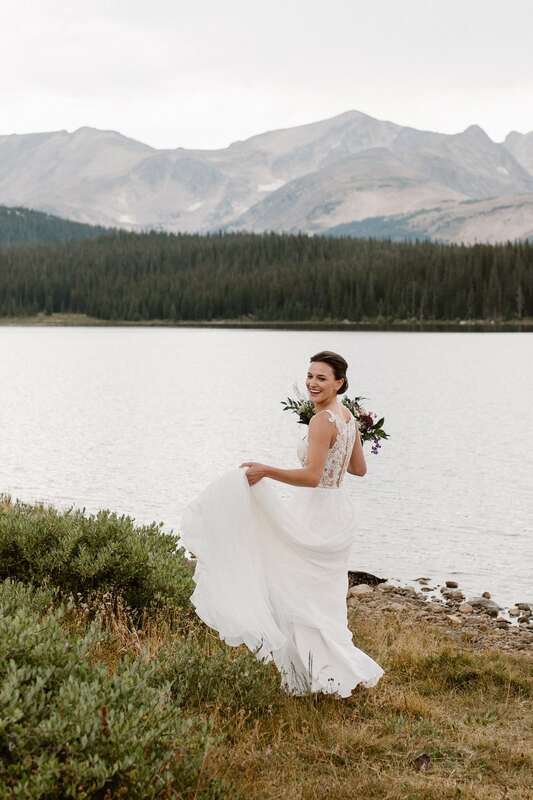 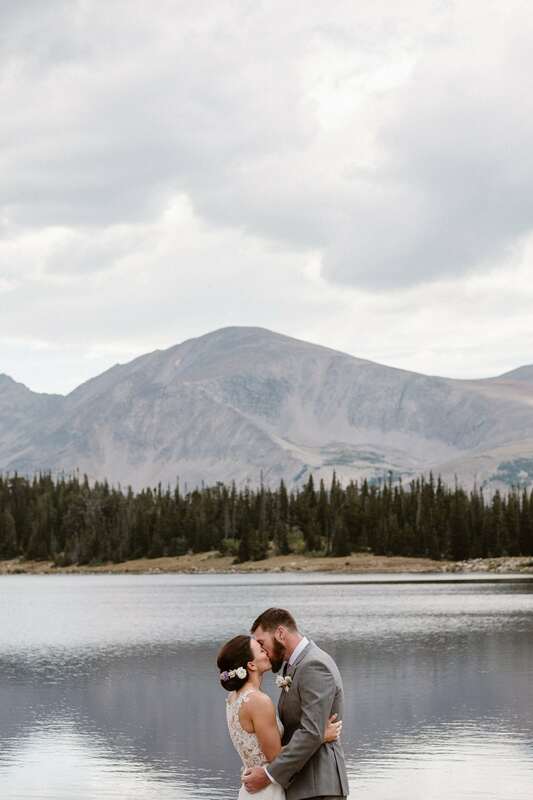 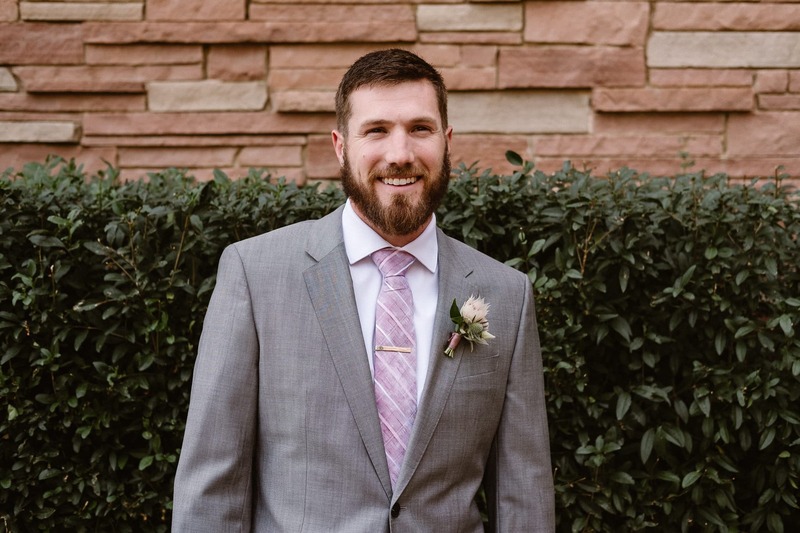 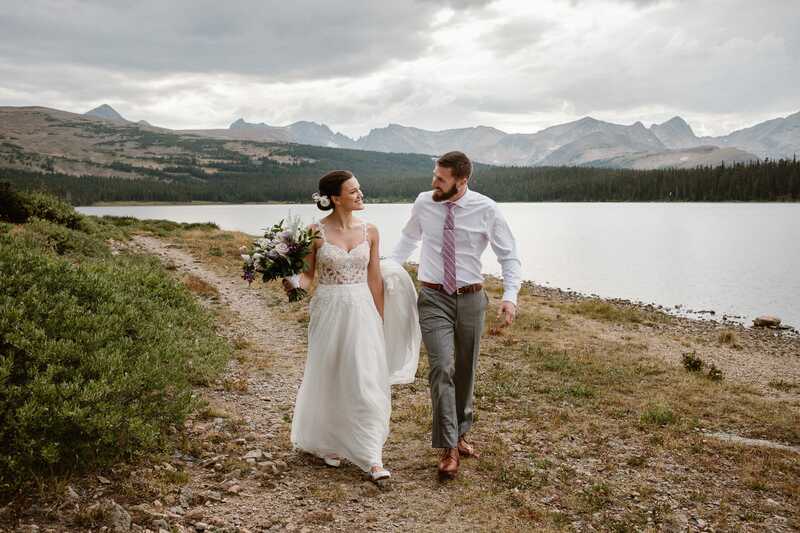 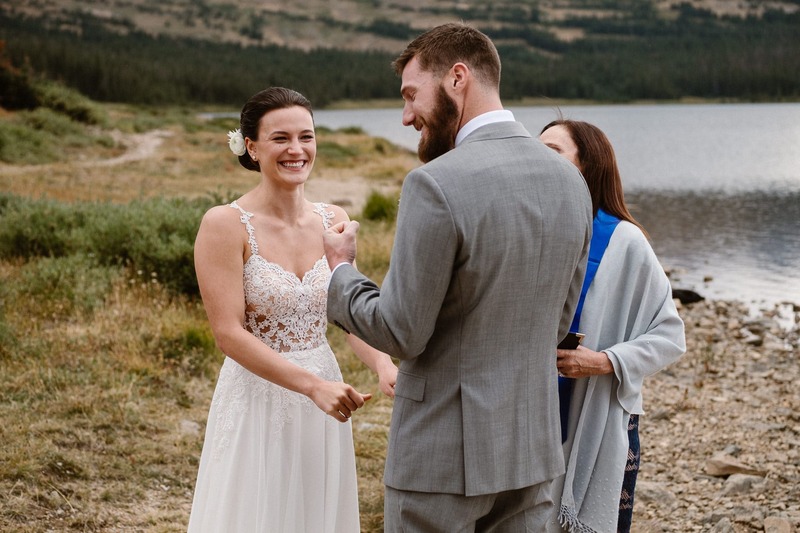 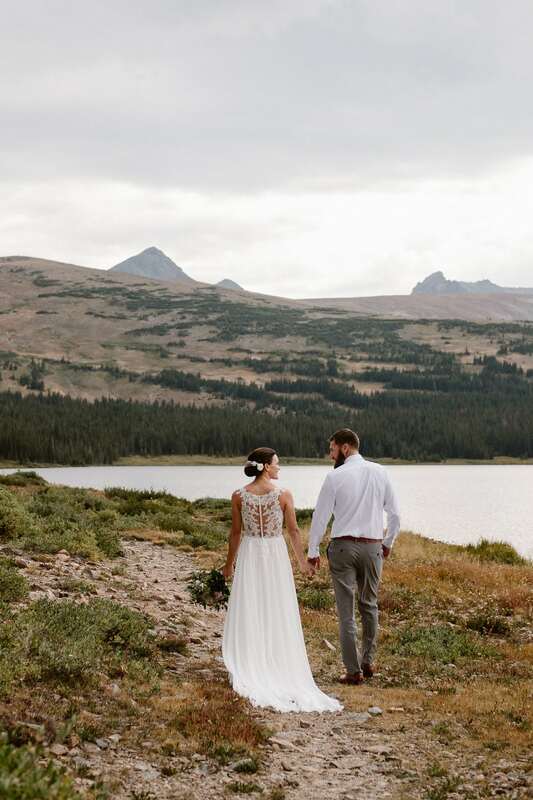 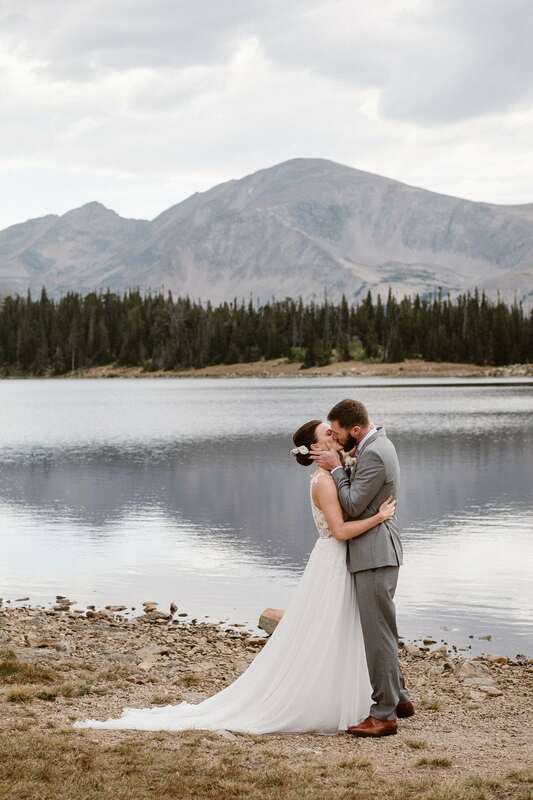 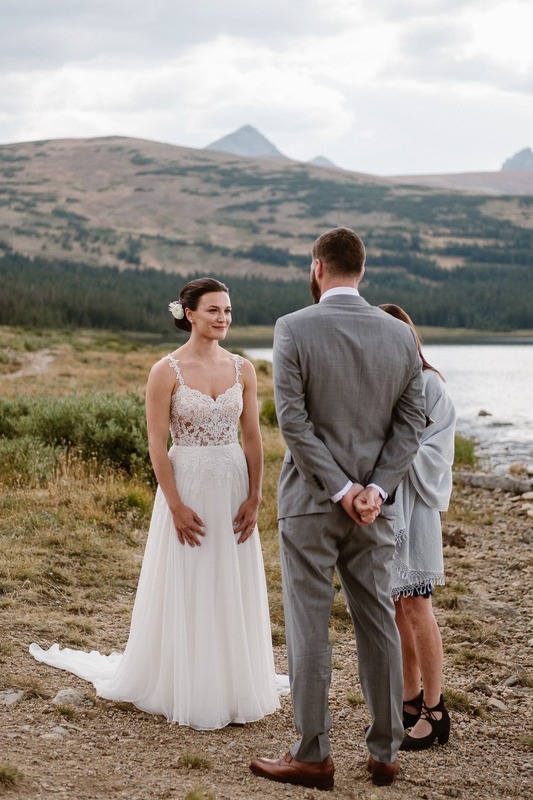 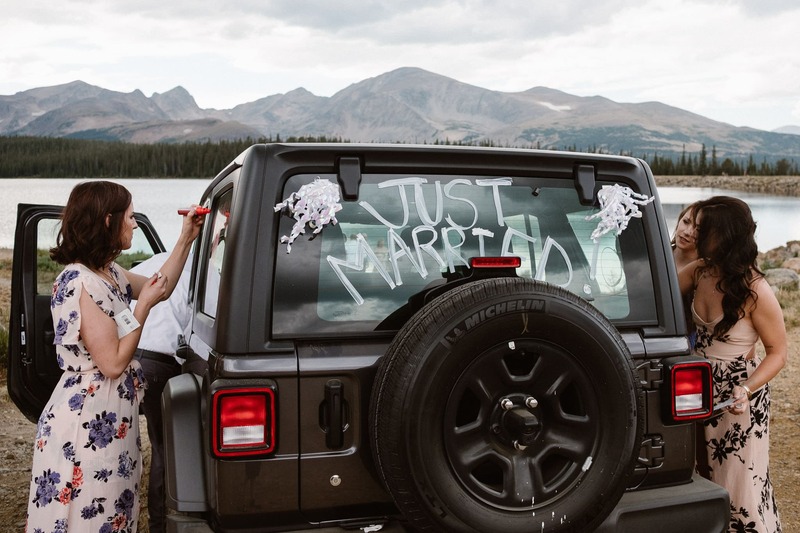 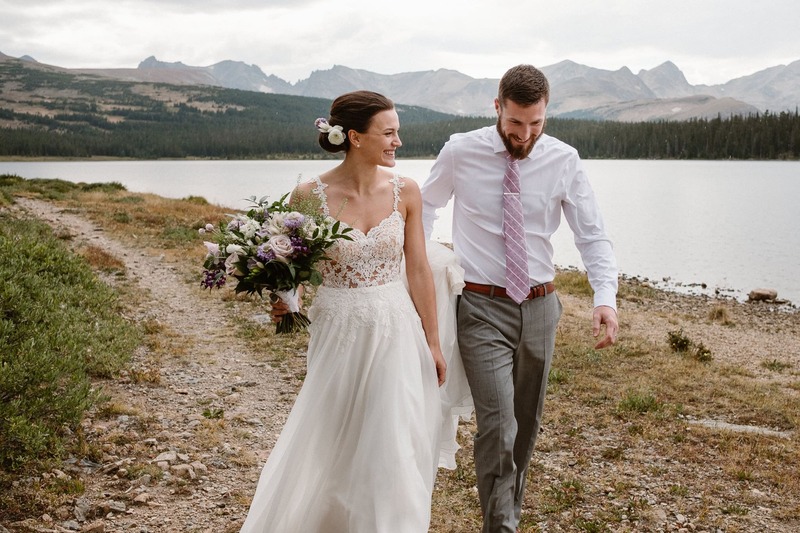 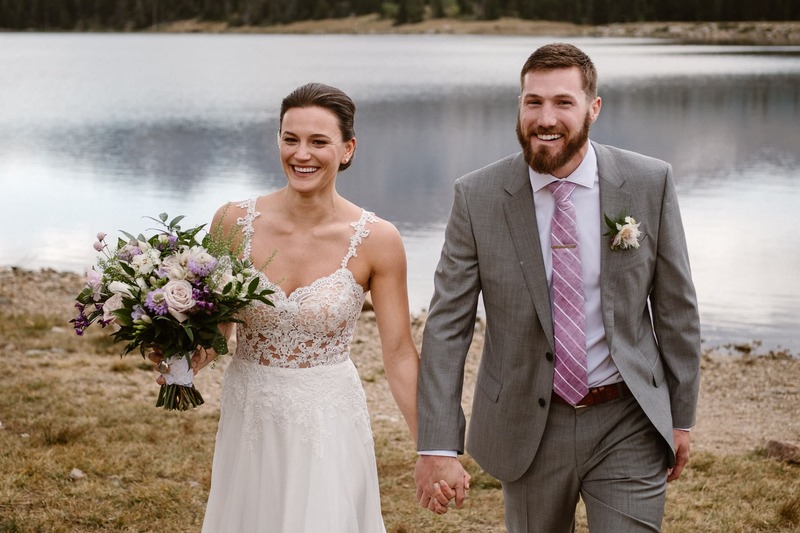 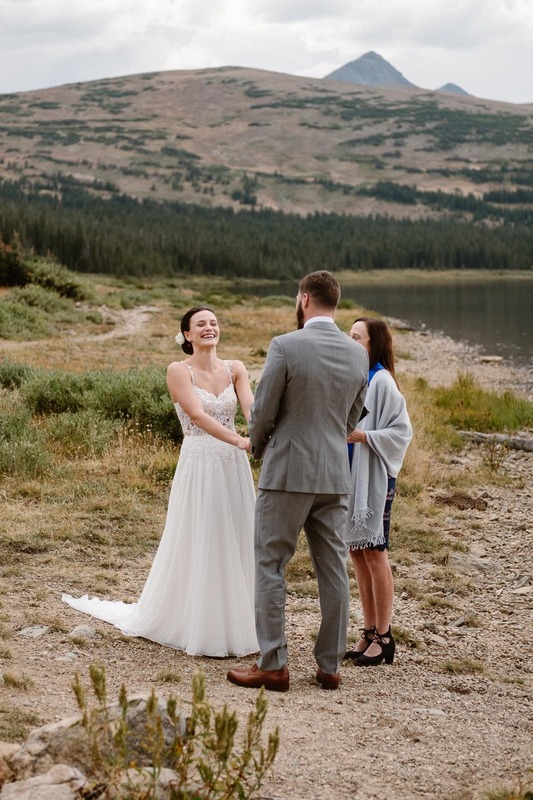 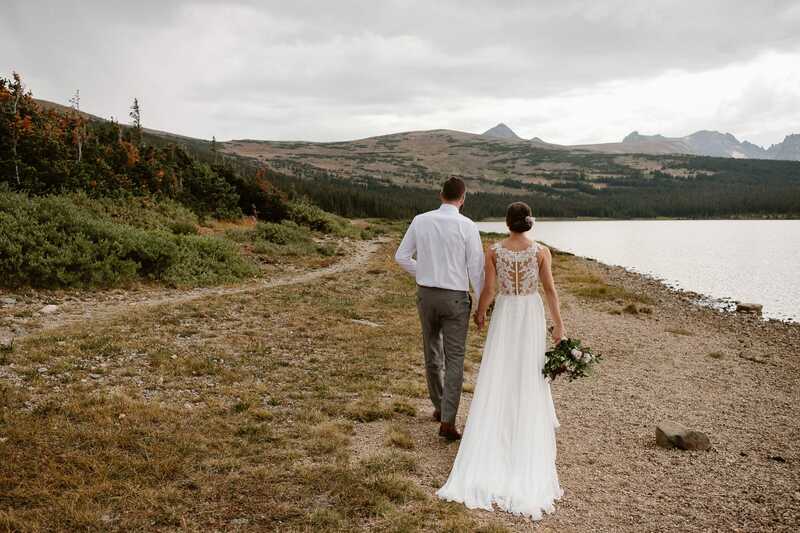 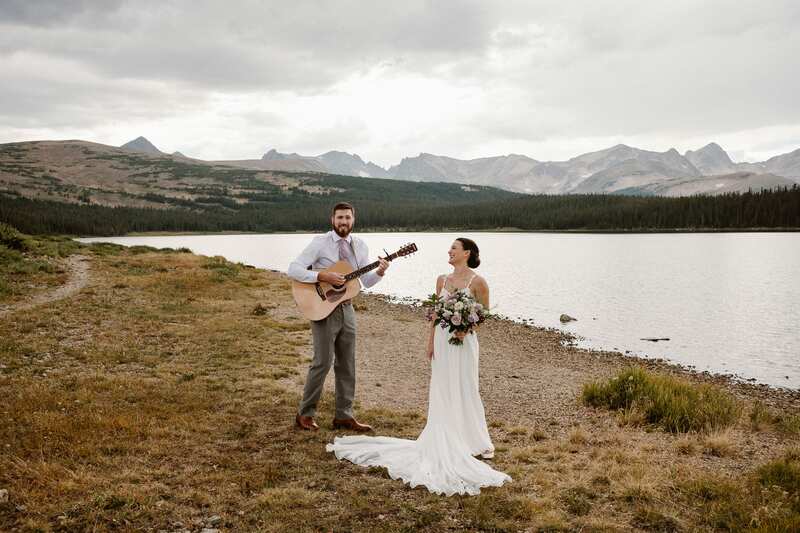 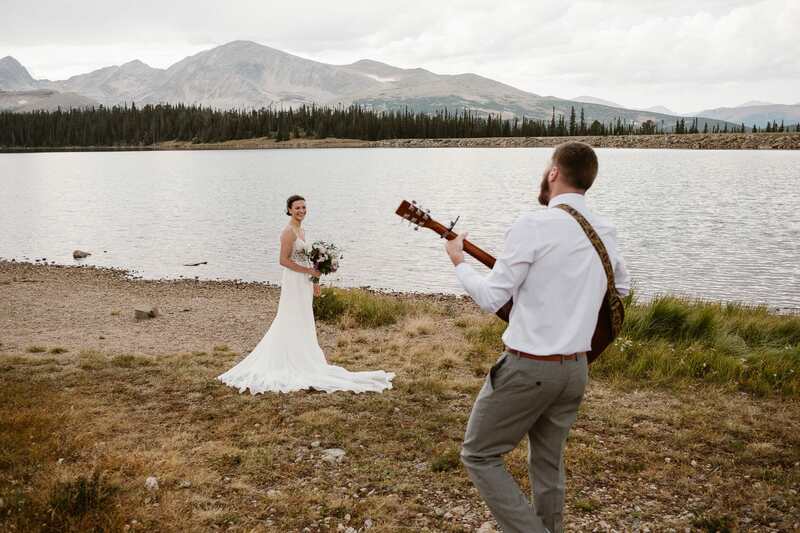 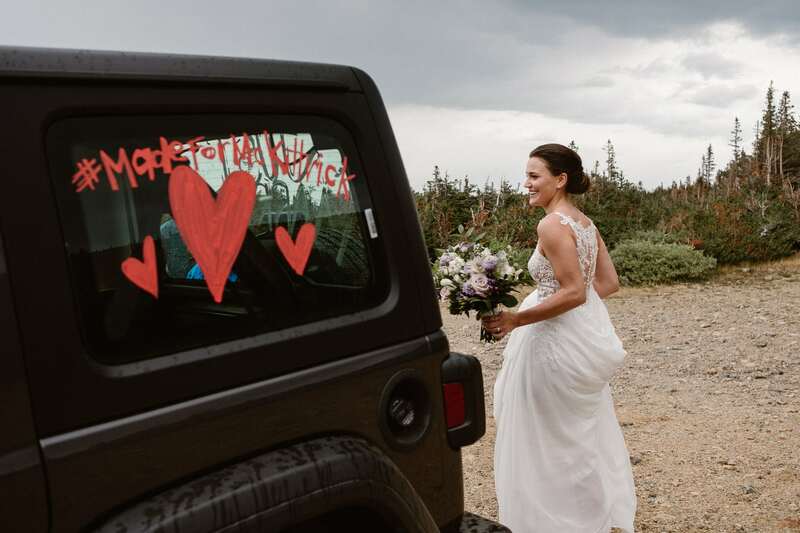 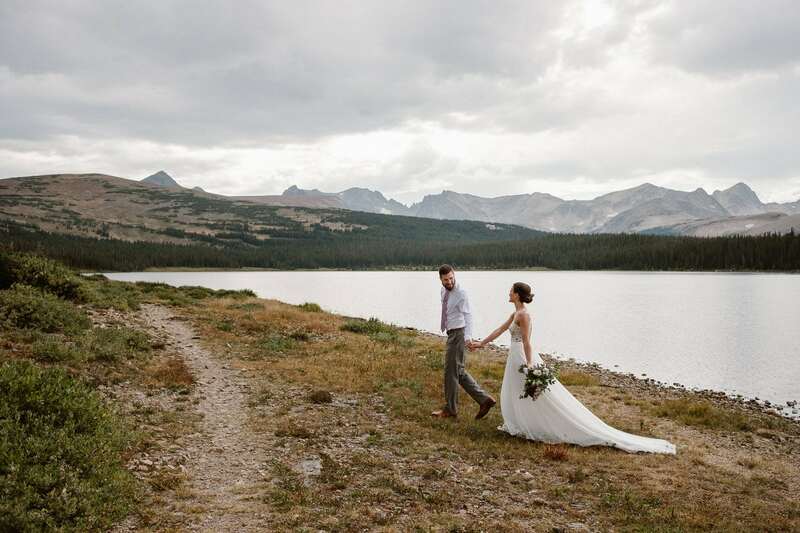 When both the bride and groom had gotten ready, we all got in our cars and drove up into Indian Peaks Wilderness for their Colorado mountain elopement ceremony. 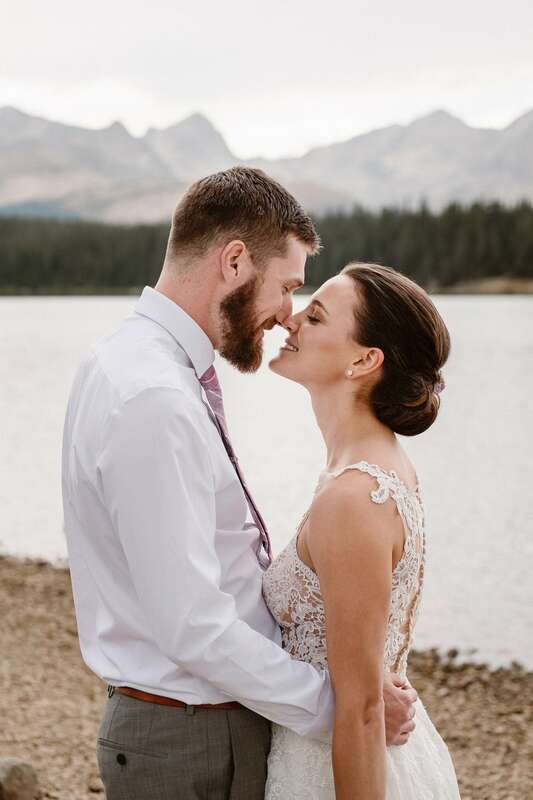 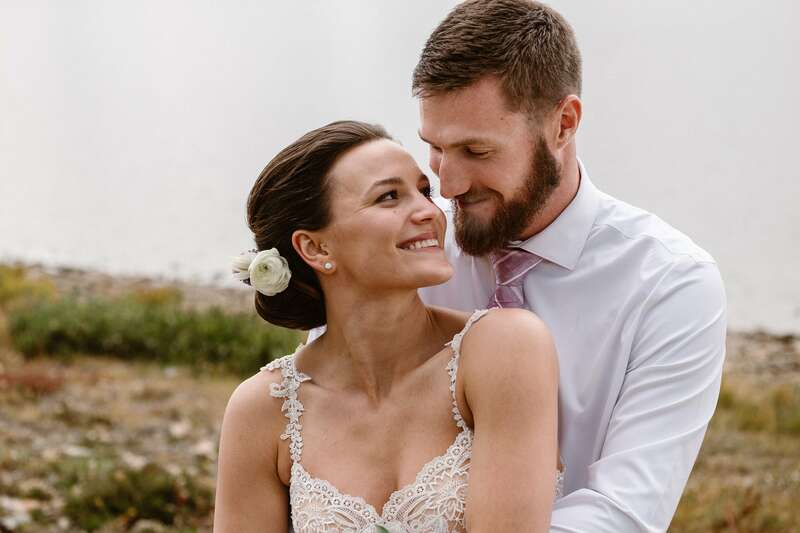 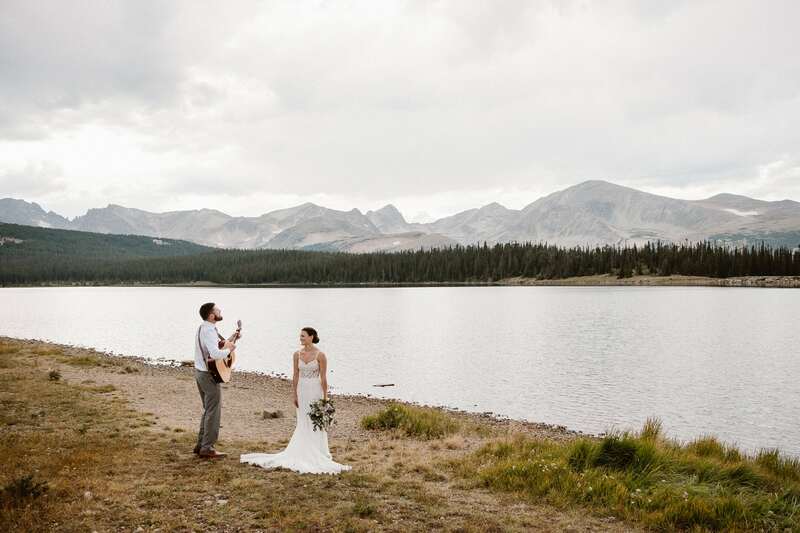 Kimberly and Kevin picked a location that they had come across right after moving to Colorado, and it was such a perfect spot. 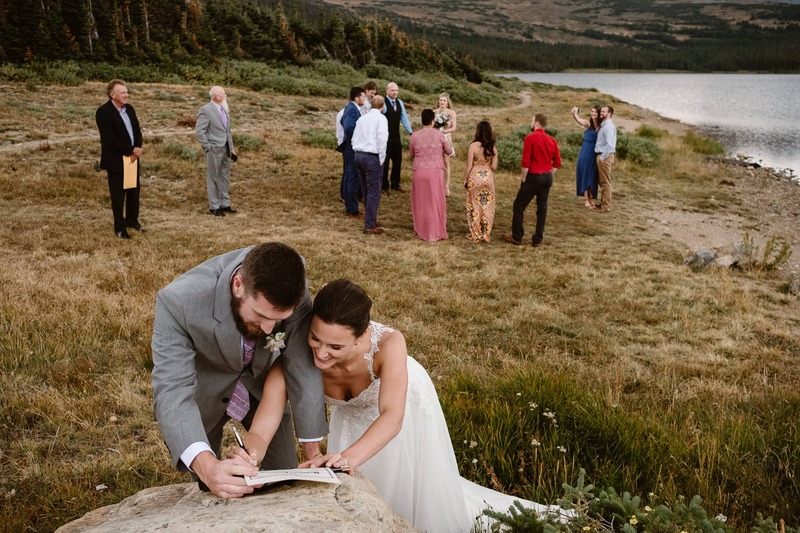 There were hardly any people around, even on a nice Saturday in August – probably thanks to the crazy 4WD road we had to take to get up there! 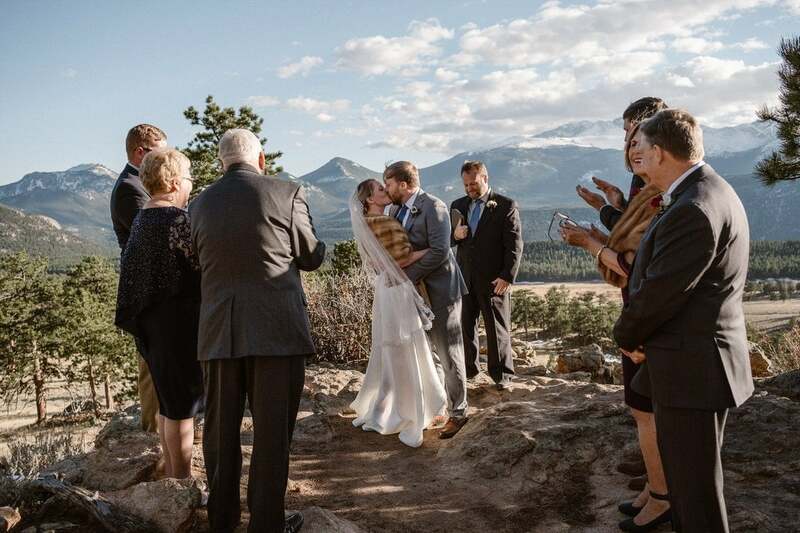 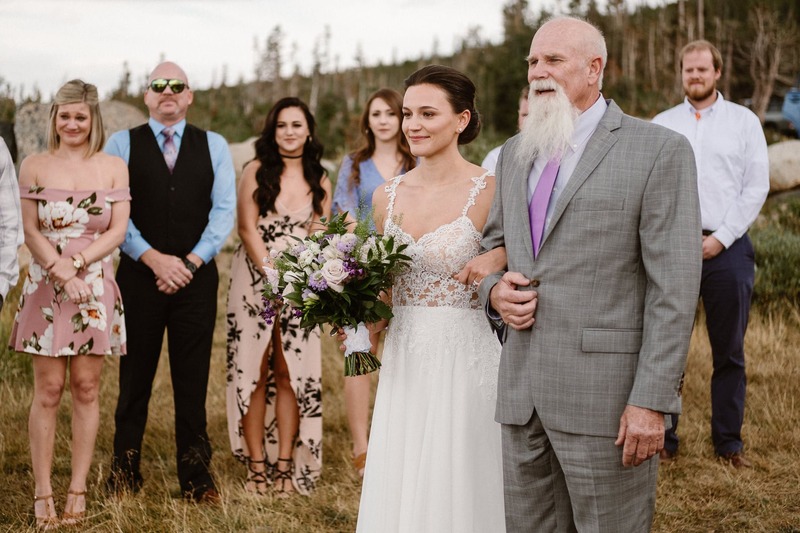 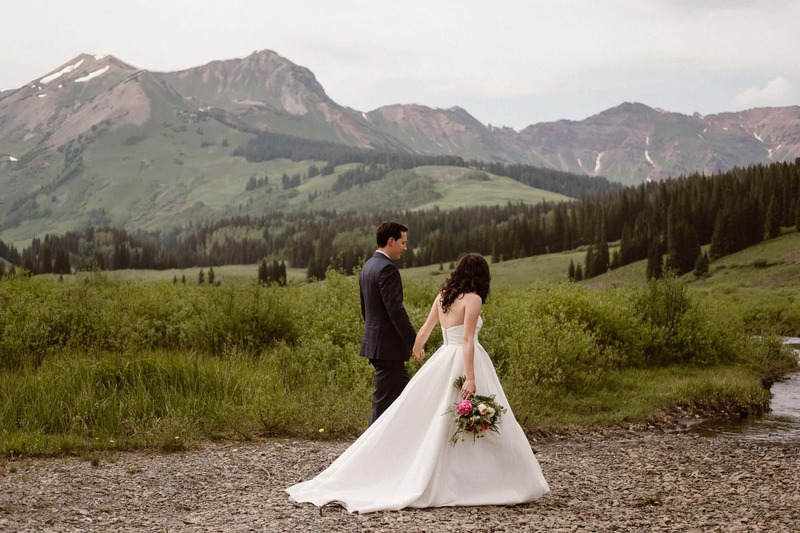 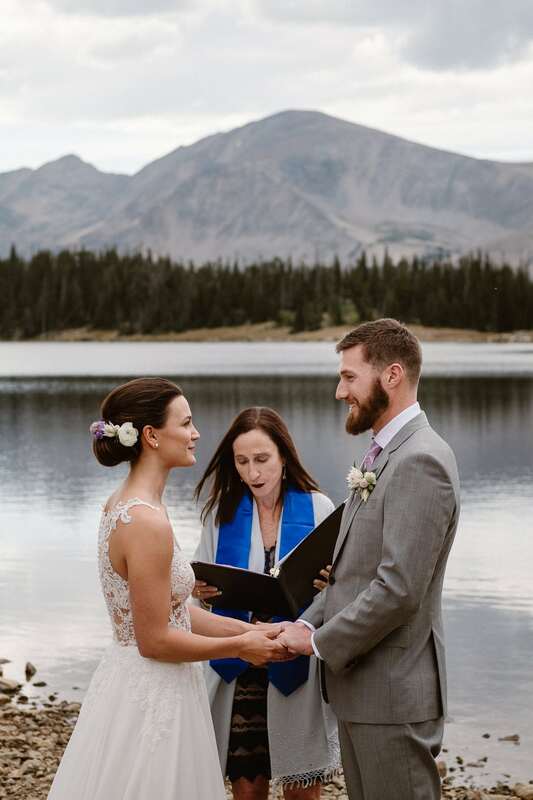 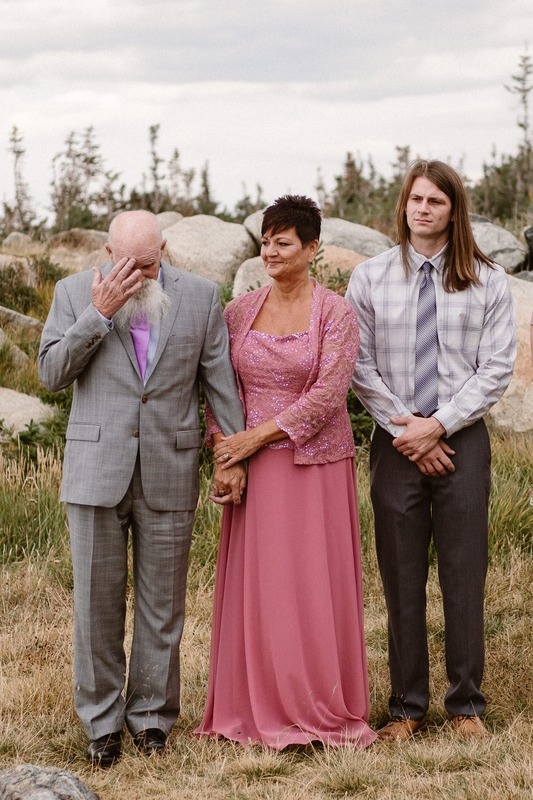 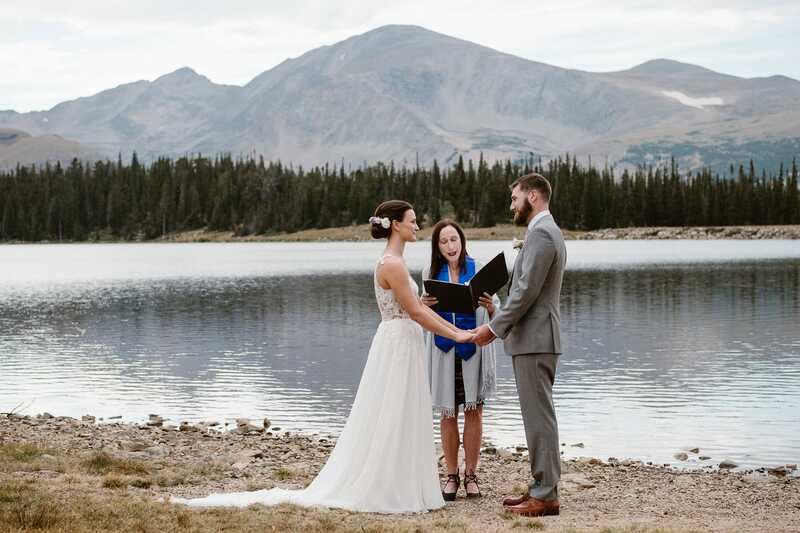 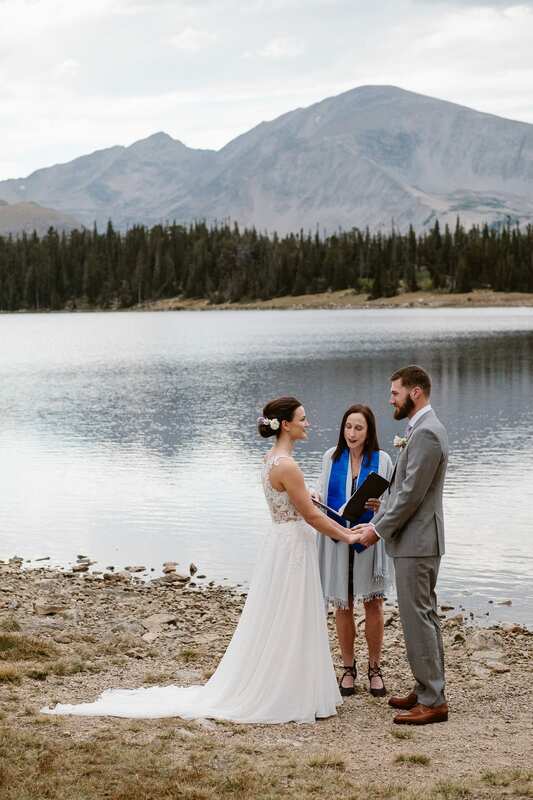 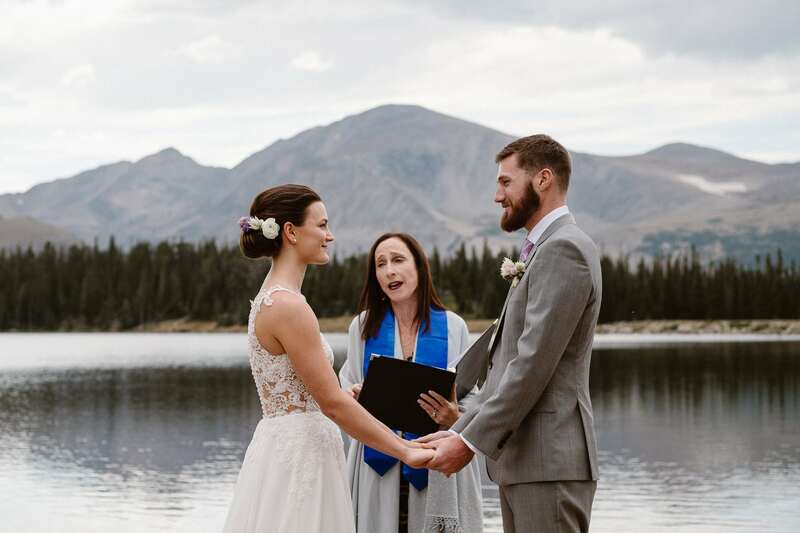 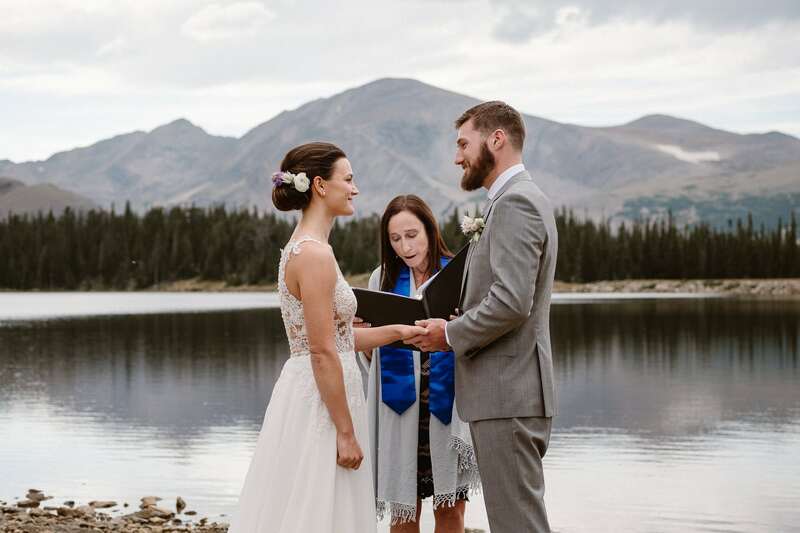 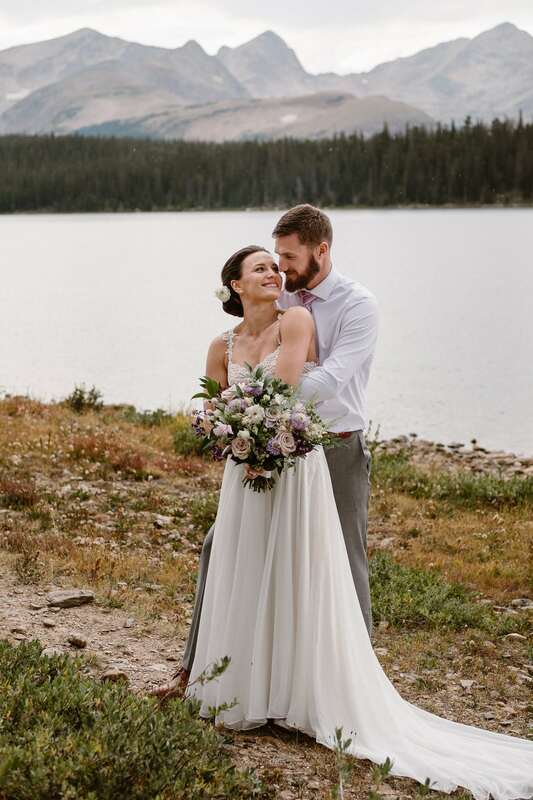 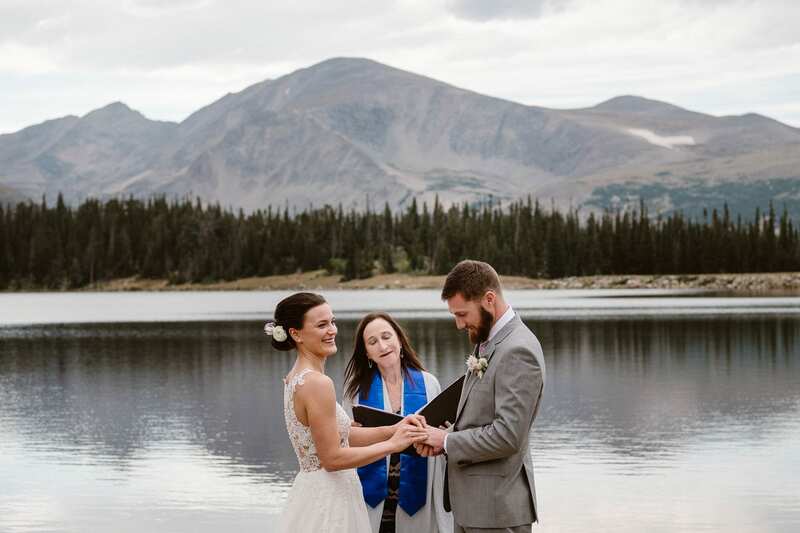 Their officiant Jane had helped the couple put together a beautiful ceremony for their Colorado mountain elopement. 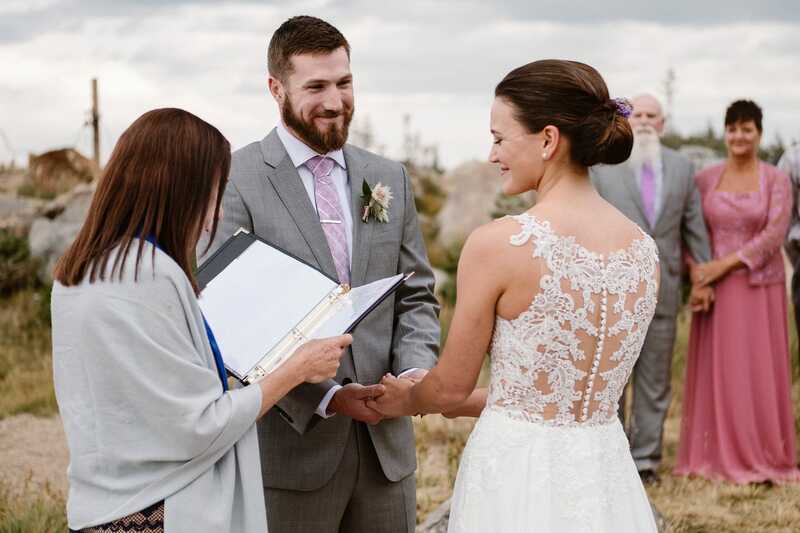 It really makes such a huge difference to have an officiant who’s not only good but GREAT at their job, and Jane is one of these. 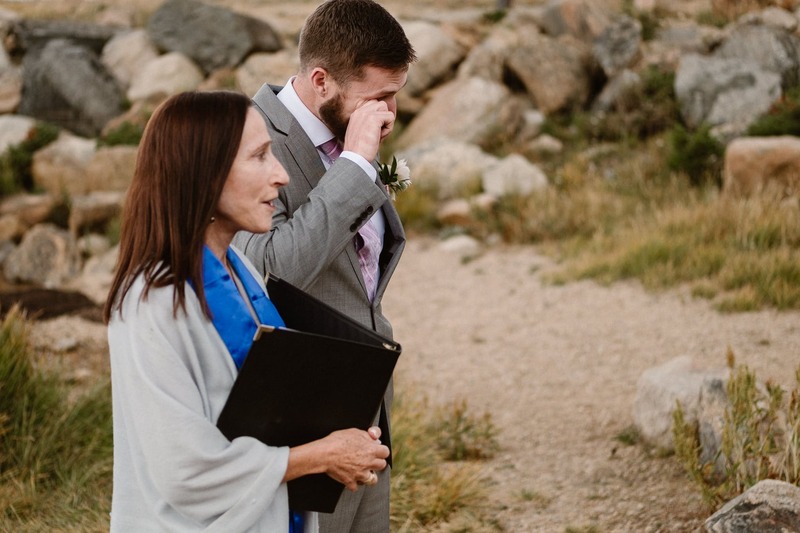 There was so much laughter and tears during the ceremony, and it truly was the perfect representation of who Kimberly and Kevin are as a couple. 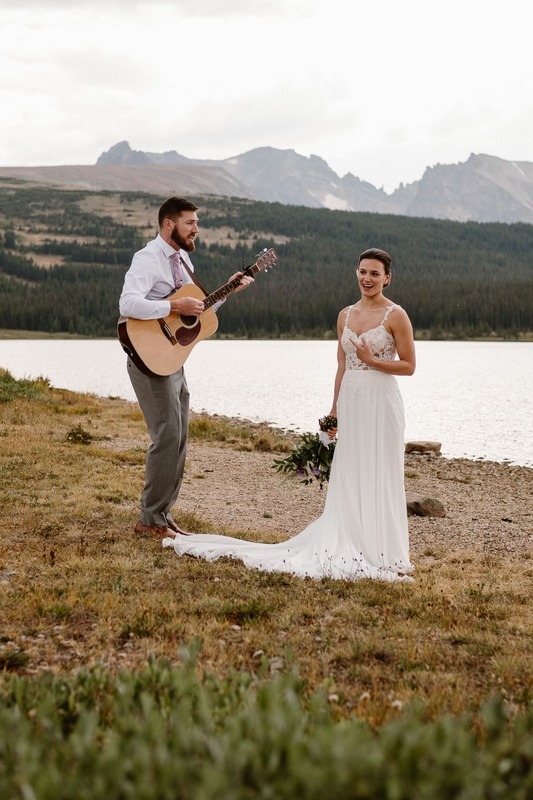 After the ceremony, I pulled Kimberly aside for some bridal portraits … only to be taken by surprise when Kevin walked up to her singing and playing guitar! 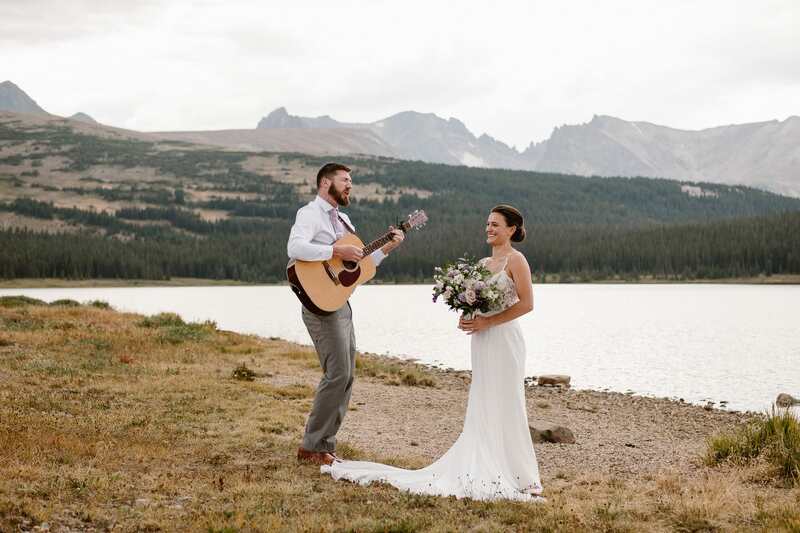 I didn’t know the story at the time, but later learned that Kevin got the guitar from his grandpa, and that his grandpa used to ask when Kevin and Kimberly would get married as soon as they started dating. 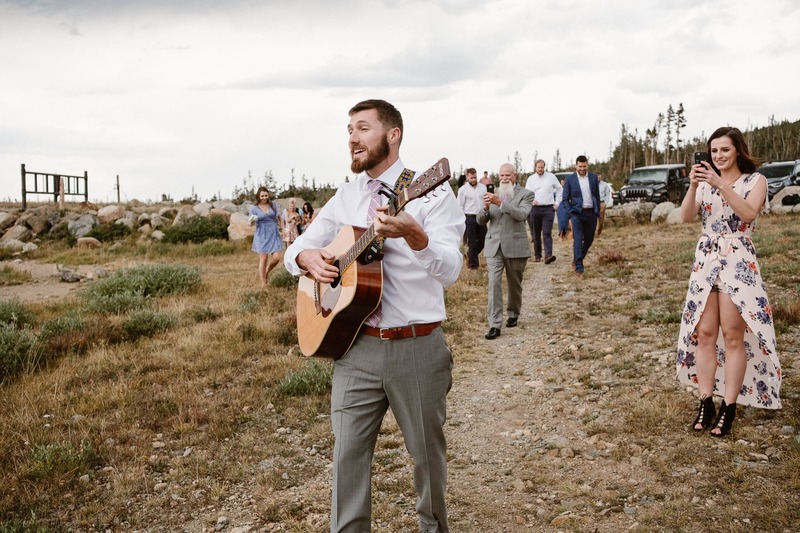 He passed away a couple of years ago, and so for Kevin to sing and play for Kimberly at their wedding was the perfect way to remember him on such a special day. 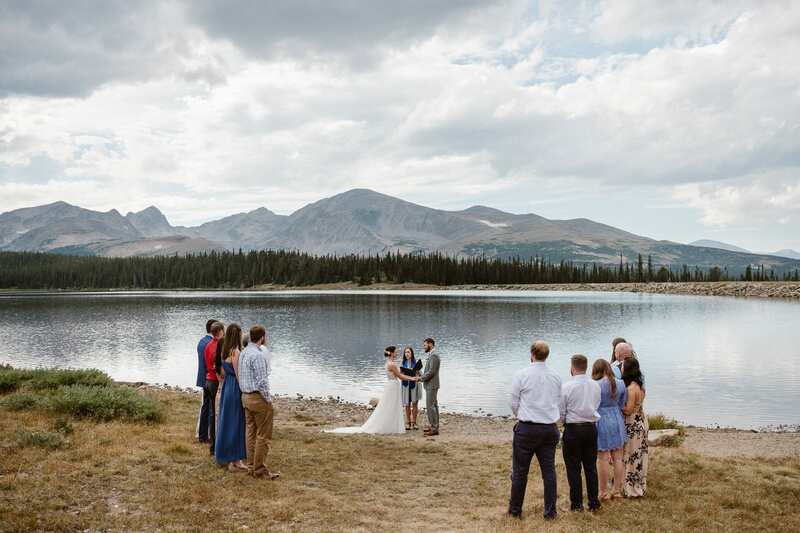 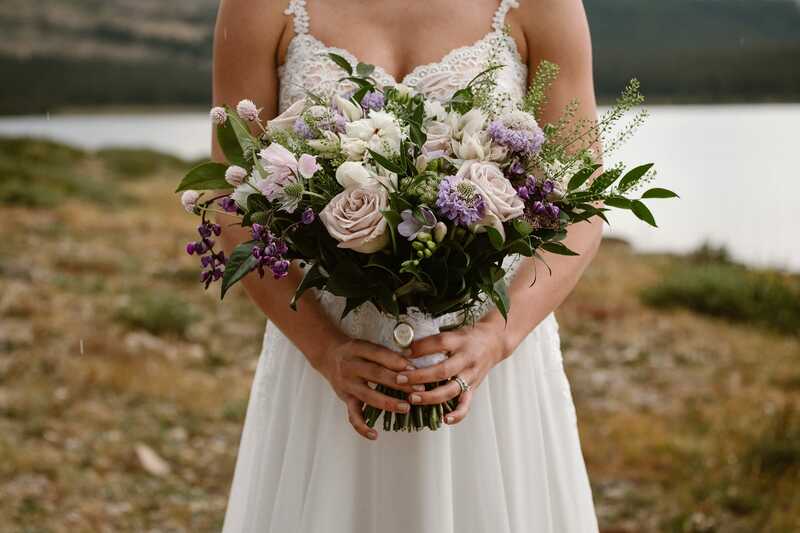 Shoutouts to all the vendors involved with making Kimberly and Kevin’s Colorado mountain elopement such a beautiful day!